Claptrap's New Robot Revolution pits players against deadly mercenaries, a rebelling robotic army, and a ninja assassin. Gearbox's RPG and shooter hybrid, Borderlands, was a massive success for the developer, due in large part to its cooperative mode. Players blew through the game and demanded more. With demand remaining high even after the release of three downloadable add-ons last winter, publisher 2K announced a fourth expansion in March. After months of silence, the publisher revealed today that the fourth expansion, Claptrap's New Robot Revolution, will pit players against a rebellious army of mechanical monstrosities. Claptrap's New Robot Revolution places players right in the middle of a war between the mercenaries of the Hyperion Corporation and an uprising army of homicidal Claptrap robots led by the Ninja Assassin. You and three of your closest friends take on the role of vault hunters, who must put aside their past conflicts with Hyperion for a chance at a hefty payday. In game terms, the expansion will add twenty new missions and tons of new enemies. Players will have to survive boss battles, waves of robot attacks, betrayals from your supposed Hyperion allies, and robot-modified versions of the local fauna. Characters can earn up to ten new skill points (bringing the total to seventy-one) and three additional backpack slots. If you were looking for any other reason to try the expansion, Christoph Hartmann, president of 2K, sells it quite eloquently: "In addition to serving as the perfect bookend to the original game, what gamer doesn't love a kung-fu-wielding Ninja Assassin Claptrap with nunchuck skills?" 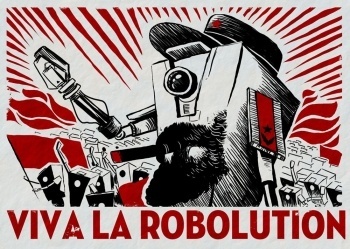 Borderlands fans will be able to download Claptrap's New Robot Revolution for the Xbox 360, PlayStation 3, and PC at some point in September for $9.99 (800 MS points).